(3) Bondi Deposit – 4.1Mt @ 2.1g/t Au for 282,000oz Au (measured and indicated) and 2.5Mt @ 1.8g/t Au for 149,700oz Au (inferred), reported at a 0.5 g/t Au cut-off. i. The historical estimate of the Bondi Deposit reflects a mineral resource estimate compiled by Orezone Gold Corporation (“Orezone”) which has an effective date of February 20, 2009. The historical estimate is contained in a technical report titled “Technical Report on the Mineral Resource of the Bondigui Gold Project”, dated date of February 20, 2009 and prepared by Yves Buro (the “Bondi Technical Report”). Yves Buro is an employee of Met-Chem Canada Inc and is considered to be independent of Orezone and Sarama. The technical report is available under Orezone’s profile on SEDAR at www.sedar.com. ii. Sarama believes that the historical estimate is relevant to investors’ understanding of the property, as it reflects the most recent technical work undertaken in respect of the Bondi Deposit. iii. The historical estimate was informed by 886 drillholes, assayed for gold by cyanidation methods, were used to interpret mineralised envelopes and geological zones over the area of the historical estimate. Gold grade interpolation was undertaken using ID² methodology based on input parameters derived from geostatistical and geological analyses assessments. Field measurements and geological logging of drillholes were used to determine weathering boundaries and bulk densities for modelled blocks. iv. The historical estimate uses the mineral resource reporting categories required under National Instrument 43-101.
v. No more recent estimates of the mineral resource or other data are available. vi. 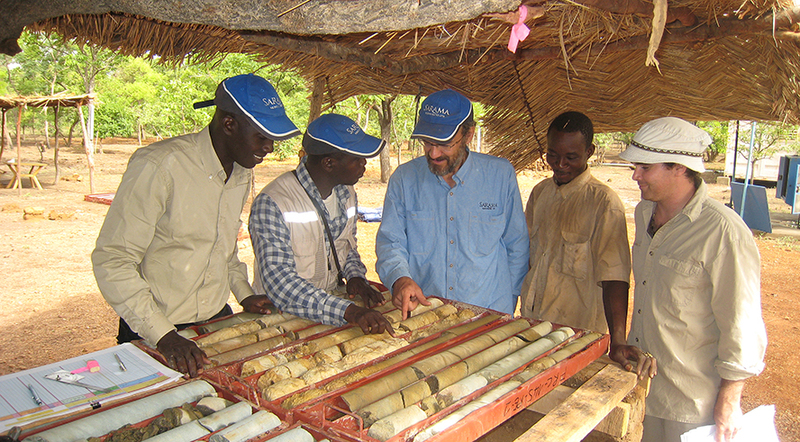 Sarama is currently undertaking the necessary verification work in the field and on the desktop that may support the future reclassification of the historical estimate to a mineral resource. vii. A qualified person engaged by Sarama has not undertaken sufficient work to verify the historical estimate as a current mineral resource and Sarama is therefore not treating the historical estimate as a current mineral resource.